A photograph and transcription of the War memorial in the Wesleyan chapel at Topcliffe, North Yorkshire, has been published elsewhere on this site. The parish church also contains a memorial listing the same 20 men, which raises some interesting questions. Two men on the war memorials, James Cook and Maurice Harland, do not appear on the roll of honour supplied in 1929. A variety of explanations are possible. This document gives more detail about the fallen. In some cases the surname given differs from other sources. Pte. Edgar Hudson 201945 9th West Yorkshire Regt. James Barningham 242706 Yorkshire Regt. John Lynch 17900 1st West Yorkshire Regt. Pte. James William Place 28202 8th Yorkshire Regt. Pte. John Tom Dunning 20713 7th Yorkshire Regt. Pte. Harry Lister Dresser 27325 2nd Yorkshire Regt. Pte. Fred Barker 32539 Yorkshire Regt. Pte. 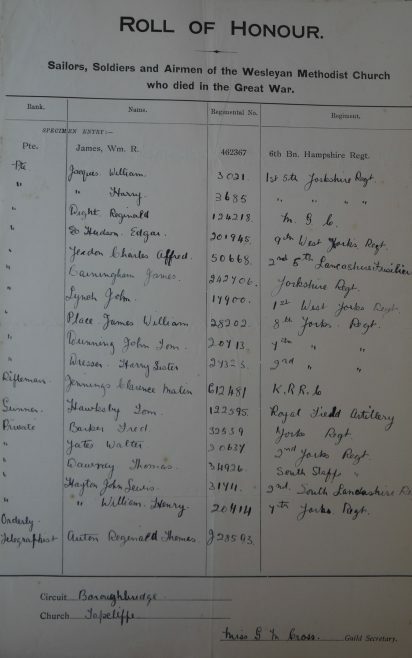 Thomas Dawney 34926 South Staffordshire Regt. Pte. John Lewis Hayton 31711 2nd South Lancashire Regt. Pte. William Henry Hayton 201414 7th Yorkshire Regt.